Back cover blurb: How close is too close? Connie and Ness met in the park while their children played. As they talked, they realised they were neighbours. Perhaps it was only natural that they and their families would become entirely inseparable. But when Ness’s marriage ends in a bitter divorce, she is suddenly at Connie’s house all the time. Connie doesn’t have a moment to herself, no time alone with her husband, not a second to chat to her kids. It’s all too much. Something has to give. Connie has woken up in a psychiatric hospital. They say she committed a terrible crime but she says she can’t remember a thing. When Connie meets Ness in the park she thinks nothing of it. Even when she discovers that they are neighbours she doesn’t expect that their paths will cross again. She doesn’t even notice Ness’ beauty as others do. In fact, it isn’t until Ness is entwined into their lives that Connie realises how beautiful and powerful Ness is. Ness suddenly becomes much more than a neighbour as her marriage irretrievably breaks down. Ness is there at Connie's house, constantly demanding Connie’s attention, until Connie ... remembers nothing. Connie wakes up in a psychiatric hospital with no recollection of how she got there. She knows that she has been accused of committing a terrible crime, but she doesn’t know what that is, or how she is supposed to have gotten where she is now. Piece by piece Connie’s forensic psychologist tries to help her put the pieces of the puzzle back together. But Connie’s life is now so broken, that we wonder if it can ever truly be put back together. 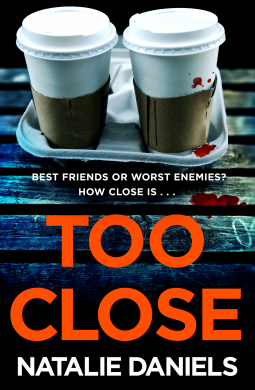 Too Close is very cleverly written and it’s title could be perceived to be about any one of the many complex relationships explored in this novel. Too Close is a great read if you are looking for something a little different, and I look forward to more from this author. Too Close is available now via Amazon online and all good book shops.